On a misty Sunday in May, pro angler Mike Iaconelli is on a mission. He wants to finish a puzzle. It’s not a puzzle with 100 pieces that need to be put together on a board. It’s the one in Iaconelli’s mind when he’s trying to catch a fish. The South Philadelphia native has more than a dozen titles to his credit, including Angler of the Year, and the Bassmaster Classic, fishing’s Stanley Cup. He now lives in New Jersey, where this past weekend he hosted the inaugural "Ike’s Hook 'Em Early Kids Fishing Tournament" for more than 200 kids. The participants, age 15 and under, were treated to free food, drinks, gifts, and prizes. But the real reason they were there was to learn to fish. Iaconelli started the Ike Foundation three years ago with his wife, Rebecca, with the goal of getting more kids to fish. It is his way of giving back to the sport and honoring his uncle and grandfather, who helped get him started. Iaconelli says he does not remember the first time he actually went fishing. But from pictures, he says that he must have been three or four years old, trying to catch panfish and trout. Unlike other professionals, the 44-year-old bass champion didn’t fish to win until later. 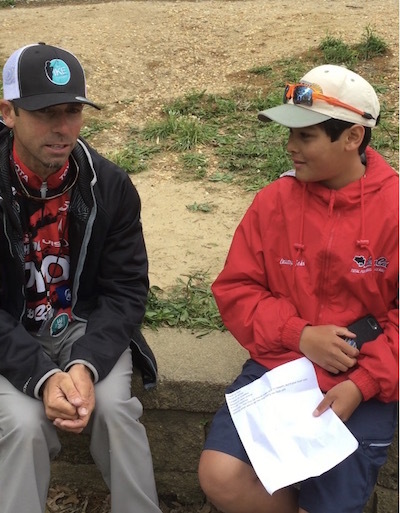 Iaconelli wishes every kid had the opportunity to pursue the sport, especially in cities where fishing isn’t common, like Philadelphia and New York City. But fishing requires considerable equipment. That’s part of the reason The Ike Foundation is so important to him. In addition to financial donations, it accepts rods and reels and distributes them to kids across the country. The foundation also encourages people who can fish to take a kid out on the water and teach him or her how. Iaconelli knows people are busy and they may not have the time to do so. But he thinks when they see the impact they can make, they might reconsider.